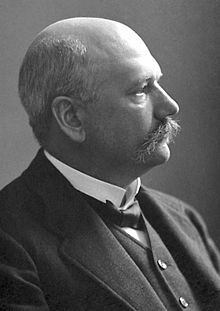 Ludwig Karl Martin Leonhard Albrecht Kossel was born on September 16, 1853 in Rostock, Mecklenburg. His father was a merchant, bank director and Prussian Council. Kossel attended gymnasium in Rostock and then in 1872 he went to the newly founded University of Strasbourg. As a youth he had shown an interest in chemistry and botany and he continued those studies at the university. He finished his studies at the University of Rostock, passing the state medical examination in 1877 and earning his medical doctor degree in 1878. After graduation he worked in the laboratory of Felix Hoppe-Seyler, who had been one of his biochemistry professors at Strasbourg. Hoppe-Seyler in addition to being a biochemist was an inorganic chemist and was interested in what chemical elements made up living tissues. In his lab Kossel studied "nucleins" the newly isolated contents of cell's nuclei. Nucleins had been discovered by Friedrich Miescher in 1869. He had determined that they were chemically different from protein, being more acidic. In 1883 Kossel became the director of the Chemistry Division of the Physiological Institute at the University of Berlin. In the period from 1885 and 1901 Kossel isolated from nuclein the five nucleic acid bases that make up DNA and RNA: adenine, guanine, cytosine, thymine and Uracil. These five bases are the letters of the genetic code that code for proteins. In DNA, the instructions for construction proteins are written in four nucleotides: adenine, guanine, cytosine and thymine. In messenger RNAs, the translations of the DNA code that are sent to ribosomes, where proteins are made, thymine is replaced with uracil. In 1895 Kossel became a professor of physiology and director of the Physiological Institute at the University of Marburg. In Marburg Kossel began to investigate the structure of proteins. In 1896 Kossel isolated histidine, an amino acid with a imidazol functional group. Kossel also was the first to isolate theophyllin a therapeutic drug found in cocoa and tea. In 1901 Kossel became the director of the Physiological Institute at Heidelberg University. In 1910 Kossel was awarded the Nobel Prize "in recognition of the contributions to our knowledge of cell chemistry made through his work on proteins, including the nucleic substances". In 1924 Kossel became professor emeritus at Heidelberg, but continued teaching. His research also continued as he continued working on determining the structure of proteins. Kossel died on July 5, 1927.